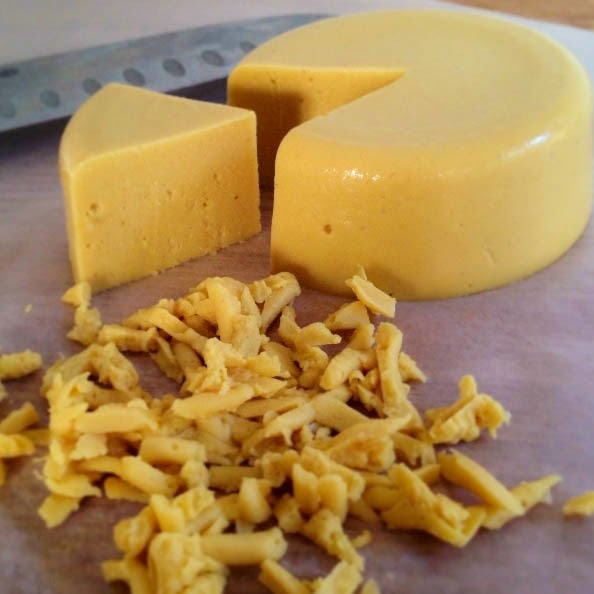 I haven't done any vegan cheese making in a while now, and I had a little extra free time on Saturday, so I decided that it was time to improve upon my last recipe for Vegan Block Cheddar Cheese. I made a special trip to the produce store to buy raw cashews yesterday, but they were out. Still determined to make cheese that night, I decided to move on to plan B and use cauliflower instead. I've used it in cream sauces before, and it always turns out delicious. Cauliflower has a neutral flavor, so it picks up the flavors well. I also used a little sweet potato to add more depth in flavors. Another benefit to using cauliflower is that it's better on the budget than raw cashews, which generally cost an arm and a leg to buy, so it's not as scary to experiment. This cheese grates and melts. I just used it to make a grilled cheese sandwich on ciabatta bread, and it was super delicious. This doesn't taste exactly like cheddar cheese, but it's definitely a good substitute. I'm waiting for rejuvelac to come in. I ordered it on Amazon yesterday. My next goal is to make something that tastes almost exactly like dairy cheese, and I've heard that because rejuvelac has a sour, fermented flavor, it generally does the trick. Be looking out for that recipe in the near future. I'm excited to try it out! Makes about 3 cups of vegan cheese. 1. Bring the cauliflower, garlic, and sweet potato to a boil in a medium saucepan. Boil for 18 to 20 minutes. Drain, and return to pan. 2. Next, stir in 1 tsp. of salt, the garlic powder, cayenne, cumin, and turmeric. 3. Add the cauliflower mixture and the sauerkraut to your food processor. Add the almond milk, nutritional yeast, lemon juice, and remaining 1 tsp. salt. Pulse until smooth, scraping the mixture off the sides as necessary. 4. In a medium saucepan, bring the water and agar powder to a boil. Reduce heat to low and simmer for 7 to 10 minutes, whisking almost constantly. 5. Once the agar mixture is ready, pour it into the food processor and process until a smooth and creamy mixture has formed. 6. Grease a bowl or container, and pour the cheese mixture into it. Let it cool on the counter for at least 15 minutes. Refrigerate overnight. *(Do not use So Delicious Brand Almond or Soy Milk - for whatever reason, it doesn't turn out well when cooked). Wow! I am going to try this recipe! Also, for that fermented flavor I like to use a little miso in my cheese recipes. It's pretty easy to find in health food stores. Have never heard of rejuvelac? Yes, I have heard of rejuvelac, but I can never seem to get my hands on it! I've never gotten the chance to try making it myself. This looks amazing and I'm thrilled that it doesn't use cashews since I can't eat them! Thanks for sharing! !